Here’s what’s up in the world of TV for Thursday, May 18. All times are Eastern. 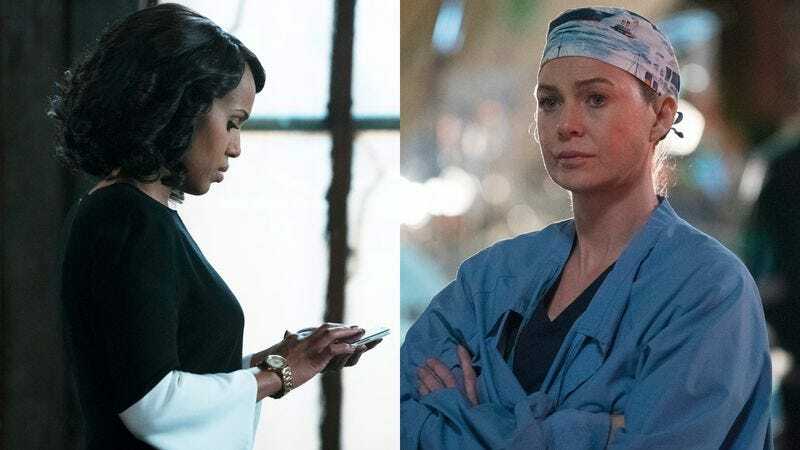 Grey’s Anatomy (ABC, 8 p.m.) / Scandal (ABC, 9 p.m.): There’s just a little more red wine left in the TGIT bottle, and it comes in the form of a dangerous patient on the loose on Grey’s and a regime-change twofer from Scandal. Gwen Ihnat has put all of Seattle Grace Mercy West on lockdown, while Ashley Ray-Harris makes final preparations for the inauguration of President Mellie Grant. Naked And Afraid XL Pop-Up Edition (Discovery, 8 p.m.): There’s gilding the lily, and then there’s sticking an “XL” and “Pop-Up” at the end of a title like Naked And Afraid.